MUSIC Matters is one of the largest student organizations at the University of Michigan, with approximately 200 members. Each of our members is able to make a unique contribution to our mission and our events. Our organization is structured with 5 committees that each serve an important purpose to help us use music to unite campus and spark social change. The SpringFest Committee works to put on our annual daytime festival held in the University of Michigan Diag and on North U. 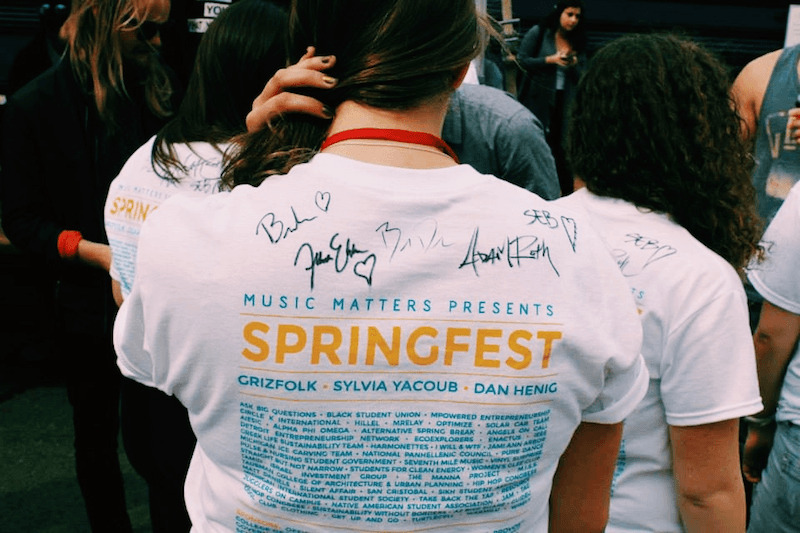 The Talent and Concert Committee orchestrates the nighttime benefit concert for SpringFest, as well as works with local artists for open mic nights, our annual Battle of the Bands, and the day stage of SpringFest. The Marketing committee handles all of MUSIC Matters' marketing and social media plans, and creates strategies and messaging to share our events with the greater Michigan community. The Fundraising committee secures the support of corporate sponsors, works to strengthen our ties with U of M schools and departments, and organizes various fundraising events to secure funding that make our events and social ventures possible. The Social Venture committee plans and runs our social venture initiatives - the Big Thinkers Scholarship, MoVE: Michigan Overnight Experience, and the CoMMunity Partnership.